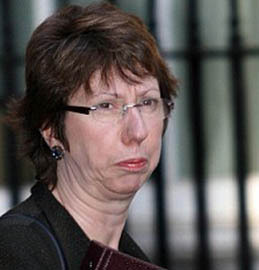 I’ve just been looking up the history of Lady Catherine Ashton, who was appointed last week to the post of Representative for Foreign Affairs and Security Policy to the European Union. Nothing too taxing, just a quick browse through Wiki (which is almost always wrong, I grant you) and some other background stuff. It does occur that short of being a field officer for Al Qaeda she could not possibly have followed a career more damaging to Britain, nor more emblematic of where we are now. She began as an administrator for the Campaign for Nuclear Disarmament, an organization so stupid even the Russians burst into laughter when its name was brought up. This was followed by a spell at the Central Council for Education and Training in Social Work, the institution which works hard to inculcate in our social workers incompetence, stupidity and political correctness. Then she hopped over to the National Council for One Parent Families, an organization which likes one parent families and thinks they are a Good Thing. Later, she received an award from the unspeakably ghastly homosexuals at Stonewall, presumably for some hideous manifestation of political correctness. For all this stuff she was made a life peer. Then, without the remotest experience in trade matters she was appointed EU trade commissioner. Never elected by anyone, anywhere, totally unqualified for almost every job she has done, she has risen to her current position presumably through a combination of down-the-line Stalinist political correctness and the fact that she has the charisma of a caravan site on the Isle of Sheppey. Quite incredible, really. And I spent valuable hours having a go at that poor woman Jeanie, the Devon County Council equality rights and gypsy awareness officer, when this unelected, useless, nonentity was poised to take the second most important job in Europe.